Location, natural resources. Population. The westernmost part of Russia Kaliningrad Oblast is separated from the rest part of the country by the new Baltic states. Kaliningrad Oblast has borders with Poland, Lithuania. Total area is 15.1 th. sq. km. Kaliningrad area is washed by the Baltic Sea and its gulfs. Natural resources. In Kaliningrad area there is largest deposit of amber (over 90 % of the world resources). There are high quality oil (annual oil production is 0.8-0.9 mln. Tons), deposits of brown coal, peat, immovable salt of the "extra" class. Transport.Kaliningrad Oblast has got developed transport network linking all regional cities and settlements. Transport communication (roads, railways, air communication) with the neighbouring countries (Poland, Lithuania), with the rest territory of Russia and European countries has its own specific features caused by enclave location of the Oblast. Road density (km/1000 square kilometres) of Kaliningrad Oblast considerably exceeds average indicator in Russia : railways - 48.3 km/1000 square km (on an average in Russia - 5.1 km/1000 square km); automobile roads - 306 km/1000 square km (on an average in Russia - 23 km/1000 square km). As to unit freight volume, Kaliningrad Oblast has indicators which are close to the average indicators for the Baltic Sea countries (2690 tons/km of railways), the lowest indicators are for automobile freight (36 tons/km of roads). Kaliningrad is a member of the Baltic Ports Organisation (BPO). Sea freight volume in Kaliningrad Oblast is lower than in all countries of the BSR (approximately 4 million tons per year), in comparison with Lithuania (14.7), Latvia (27.4), Estonia (11.8), Denmark (51.9). However, Kaliningrad, Baltiysk, Svetliy and Pionersky ports are loaded less than 30% to their capacity, there is an opportunity of considerable sea freight growth. General project capacity of all regional ports is approximately 15 million tons per year. Chernyakhovsk city agglomeration occuping the South-Eastern part of the Region. The centres of the three city agglomerations are the three large regional cities : Kaliningrad, Sovietsk and Chernyakhovsk. According to administrative hierarchy of the whole area, the Region consists of 13 districts and, hence, 13 of 22 cities have the status of a district centre. Excepting the area of the 13 districts, the part of the regional area is under direct authority of city administrations: Kaliningrad, Baltijsk, Svetlogorsk, Pionerskiy, Sovietsk. Kaliningrad is the administrative, political, intellectual, economic and cultural centre of the enclave Russian Region. There are all branches of the authorities: the Regional Government (executive authority), the Regional Duma (legislative authority), all regional judicial bodies (judicial authority), as well as bodies of all political parties, printing-houses, mass media editions and studios. Work of Regional Organizations of Federal subordination is coordinated by Plenipotentiary Representative of President of Russia in Kaliningrad Oblast. The governor of the Kaliningrad Oblast inspects activity of 8 committees. According to the Federal Act "About the Special Economic Zone in Kaliningrad area", the administration of Kaliningrad Oblast fulfils functions of administration of the Special Economic Zone. Economy. GRP in Kaliningrad Oblast in 1998 - R 8659.3 mln (USD 418.3 mln), that amounts to 0.4% of GRP for Russian Federation (3.5% of GRP for Northwest of Russia). GRP per capital in Kaliningrad Oblast in 1998 - R 9140.1 (USD 441.6). Industry. Main industries are machine construction industry, pulp and paper, food (including fish) and light industry. In the area the production and processing of amber is carried on. Pulp and paper industry develops in the Region in the cities Kaliningrad, Neman, Sovietsk and the urban settlement Znamensk. Machine-building is connected as with transport complex (carriage-building, ship- building and ship-repairs) as with knowledge-based high-technological production (electronic equipment, means of automation). Production connections between cities are typical for the regional economy : for instance, Kaliningrad machine-building enterprises have subsidiaries in medium-size and small cities (Sovietsk, Chernyakhovsk, Bagrationovsk, Polessk, Pravdinsk, Neman, Ozerki settlement); Kaliningrad fishery enterprises supply with raw material canneries and fish-processing plants which are located in Svetliy, Polessk, Mamonovo. 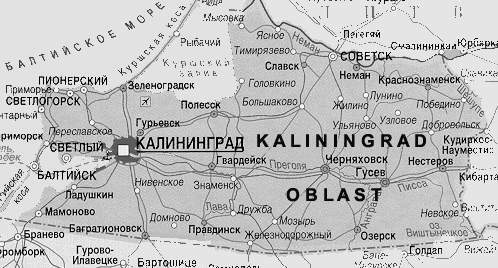 In 1994-1998 total volume of industry output in Kaliningrad Oblast reduced by 2/3. In 1999 there was some growth of industry output (4% increase over 1998). Agriculture. Regional agriculture supplies Kaliningrad and other regional cities with meat, milk, vegetables and other agricultural products for processing. Main branches are dairy and meat live-stock husbandry. Total area of agricultural land is 262 th.ha. Investment Activities & Investment Legislation. In 1999, volume of investments into the economy of Kaliningrad Oblast was R 2222 mln (19% decrease over 1999). Unusual geographical location of Kaliningrad Oblast can not fail to influence economic, political and cultural development, permanently extending connections with European and Worldwide countries. Kaliningrad Oblast has acquired the open status since the beginning of 1990s, joint ventures with partial foreign investments and even firms with pure foreign investments have been established. The founding of the German Concern BMW automobile assembly, the large Russian-Lithuanian meat-processing plant, the heavy lifting power cranes and the sea oil platforms, other enterprises are the largest investment projects. Forming of the large international multifunction transport hub, using the advantageous geographical location, direct connection with different regions of Russia and with the former republics of the Soviet Union. Creating competitive enterprises, i.e. ones providing assembling (with the use of exported parts), manufacturing of the final product and pre-selling treatment of the product from other Russian regions, together with processing industry, using the existing enterprises of the former military complex. Developing Pan-Russian and international tourism and recreation, using the most favourable nature factors, suitable social-economical and historical aspects. Reviving fishery and agriculture, aiming at creation of labour-intensive workplaces for the existing labour force, providing self-sufficiency in foodstuffs, ensuring entrepreneurship oriented behaviour. Total volume of foreign investments into the region is USD 11.3 mln in 1997, USD 39.4 mln in 1998, USD 18.3 mln in 1999. By the index of accumulated foreign investment the leaders are: Germany (34.7% of total volume of the foreign investments), the Great Britain (14.2%), Sweden (13.2%), Israel (7.9%), Poland (4.1%). The greatest share foreign investments in 1999 accounts for trade and public catering (62.2%) and industry (18.4%). 6 июля 2002 года мэру Калининграда г-ну Савенко был вручен почетный приз (почетная доска Совета Европы и денежный приз в размере 7 тысяч евро, который, по условиям конкурса, необходимо потратить на школьный обмен) за развитие партнерских связей с европейскими городами. Теперь Калининград может претендовать и на главный приз ЕС в размере 500 тысяч евро. В 1999 году ЕС удостоил Калининград переходящим почетным флагом. Новый сайт о калининградской области - "Западная россия"
В Интернете его можно найти по адресу www.westrus.ru или www.westrus.org. Новый информационный портал создан при поддержке Федерального агентства по печати и массовым коммуникациям РФ. Главная задача ресурса – показать возможности Калининградской области как пилотного региона российско-европейской интеграции.